How can I create a beautiful, practical staircase that won’t wear out? Our answer: marble! Stairs are one of the highest traffic areas in your home. They’re also typically really visible, often the first thing guests see when they walk through the door. 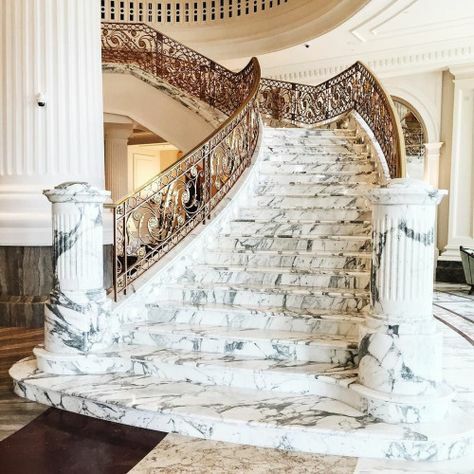 A marble staircase is both beautiful and tough, making a great first impression and lasting for decades. Marble staircases can be seen in p alaces and stately homes around the world. Thanks to modern technological developments, this luxurious stone has become available to ordinary British families. 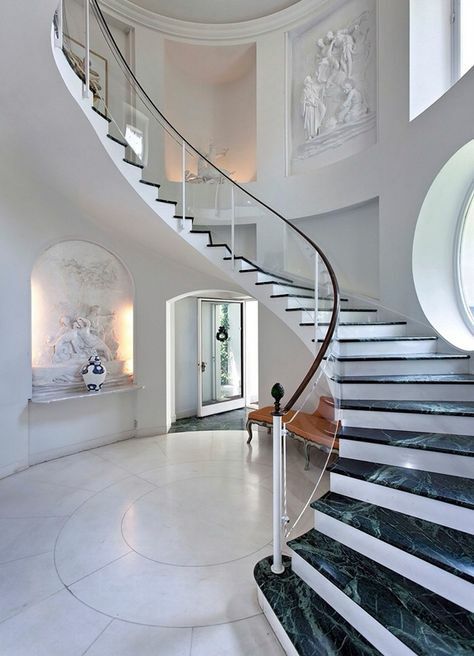 Once the preserve of the stars, a marble staircase no longer needs to come with an astronomical price tag. At Surrey Marble and Granite, we create dazzling stone stairways for families, businesses and hotels across England so we’re in a great position to help you find the best value for your money. Every slab of stone needs to be individually cut at and shaped, which means that you’ll get a staircase exactly designed to fit your home. While other materials can be ordered in bulk and may only be available in pre-cut sizes, we’re able to create the a bespoke staircase if you need it. This is ideal for properties with unusual proportions, including older homes which often have narrow stairwells, but it also lets you create a truly unique statement staircase. From the grand, sweeping staircases that dominate the halls of grand houses and stately homes to the quirky, double-landing switchbacks that inhabit period cottages, marble staircases come in every shape and size. Making the most of your space may mean a staircase design that’s non-standard, and we’re well positioned to help with that. Working directly with our customers or liaising with architectural or interior design teams, we create bespoke marble staircases that dazzle and delight. Owning a period property can feel like a weighty responsibility. A marble staircase is a great way to enhance the character of your property while also creating a home your family will love to use. Marble has been a popular choice for flooring and stairs throughout history. With a wide range of colours and styles available, at Surrey Marble and Granite we pride ourselves on being able to find the right marble for any home. A joy to use – and clean! Marble has a reputation for being a delicate stone but it’s still tough as rock. A marble staircase is waterproof, easy to clean and tough to damage. At Surrey Marble and Granite, we strongly recommend sealing all stone floors and staircases. This not only preserves the beauty of the stone but also makes it much harder to stain and easier to clean. Many of our customers find that all they need to do is sweep or vacuum and occasionally mop with a gentle cleaner. Even spills and messes are easy to handle as they don’t soak in!